Texas is a BIG place!! And it’s HOT in the Summer!! 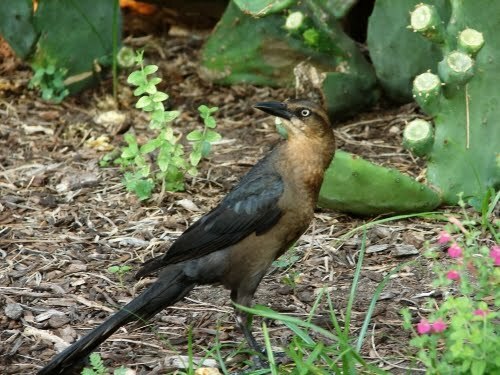 But even more than the Alamo, the thing that impressed me most was the abundance of the Great Tailed Grackles: a noisy black bird that has migrated to the southern States from Mexico. This bird is loud, annoying and has the most hysterical calls, somewhere between a siren and an Israeli gragger. A gragger is a rachet-y noise maker used for Purim whenever Haman’s name is mentioned. Listen to the sound HERE These birds are absolutely Everywhere!! They are intimidating and will aggressively “beg” for food. The picture above is a female. The male is much larger and a shiny blue-black with a big fancy tail. The local birds have been subdued and are hard to find or hear. It was so nice to come home where these invaders have not yet taken over. Previous Growing in Grace-Walking by Faith! Mid, we also have grackles to deal with! Those and starlings are rather ornery. It's amazing to see the cardinals intimidate them.